Despite several valiant attempts, Russian experts are still unable to command the Fobos-Grunt spacecraft back to nominal operations – which is required for it to carry out two critical burns to head to its Phobos destination. The spacecraft is expected to wander around in Low Earth Orbit for some time, although controllers only have two weeks to re-establish a command link to save the mission. 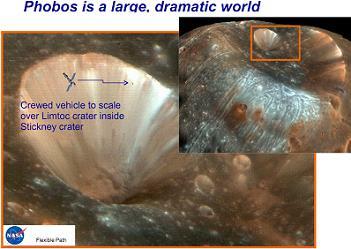 Fobos-Grunt is an ambitious sample-return mission to Mars’ larger natural satellite, Phobos. With a mass of 13,500 kilograms, Fobos-Grunt is the largest planetary spacecraft ever built in the former Soviet Union and was to be the first sample return mission to the natural satellite of another planet, and the first such mission to be conducted by Russia. In fact, Russia has enjoyed no luck with missions to the Red Planet, with all the previous 16 missions since the 1960s failing – the latter of which was the Mars-96 spacecraft, which saw its mission ended prematurely in a launch failure. 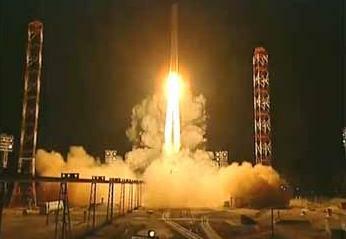 Fobos-Grunt – which was also hosting China’s first Mars probe, Yinghuo-1 as a passenger – enjoyed a nominal launch via a Zenit-2 launch vehicle, which occurred at 02:16 local time on Wednesday from the Baikonur Cosmodrome. It is understood the spacecraft did successfully deploy its solar arrays, as much as that has yet to be fully confirmed, although the mission’s nominal milestones – at least from an official standpoint – then failed to materialize. As to exactly what went wrong, very few details have been released by official sources at Roscosmos, resulting in the Russian media mainly using unnamed sources, while observers around the planet attempt to piece together the state of play with the spacecraft. As far as the mission schedule, Fobos-Grunt was set to perform an orbit-raising manoeuvre two and a half hours after launch, prior to a second burn 126 minutes later, which would have taken it into heliocentric orbit to begin its journey to Mars. However, problems were noted when observers (satobs.org/seesat) claimed Fobos-Grunt was in the same orbit after the point the first burn should have been completed. The reason for the lack of a burn from the cruise stage – derived from the Fregat stage, powered by an S5.98M engine using unsymmetrical dimethylhydrazine as propellant and nitrogen tetroxide as an oxidiser – is believed to be related to a fault with the flight computer going into safe mode, but no official cause has been confirmed at this time. What is known is Russian controllers have been attempting to re-establish a link with the spacecraft, in order to send commands. Initially it was assumed a window of only three days would be available for this effort, prior to the spacecraft’s batteries running out. Among the challenges controllers may be tasked with, when trying to communicate with Fobos-Grunt during passes over ground stations, is a potential blockage by the yet-to-be-used fuel tank of the low gain antennas. This tank – located on the aft of the cruise stage – would be expended and released in the event of both burns being completed. It is understood the spacecraft was never designed to be commanded prior to these two burns. Should the two weeks pass without a successful resolution, the spacecraft’s orbit will eventually decay to the point it will re-enter Earth’s atmosphere. Estimates on when that will occur range from between the latter part of this month, and the beginning of January. Should controllers successfully re-establish a command path, Fobos-Grunt will take eleven months to reach Mars, performing three course corrections along the way. Orbital insertion was planned for 9 October next year, when the spacecraft would be entering an orbit with a periareion of about 800 kilometres, and an apoareion of around 80,000 kilometres. 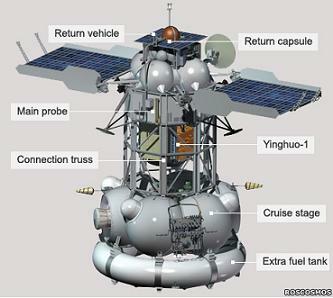 Following insertion, Yinghuo-1 would then separate from Fobos-Grunt and begin its mission. By January 2013, Fobos-Grunt would be expected to be in a 10,000 kilometre circular orbit around Mars, and would enter a quasi-orbit around Phobos in early February, before landing on the satellite later that month. In either late February or March, the spacecraft’s return module would lift back off from Phobos, and return to heliocentric orbit for the journey back to Earth. It would be expected to arrive at Earth in August 2014. This moon is of interest not only for the Russians, but also for NASA – as seen in the post-Augustine Commission “Flexible Path” overviews – which remains the only expansive review into a Mars mission outline of late. Based around the well-known, but undefined main goal for NASA’s Human Space Flight program, the Flexible Path approach cites Phobos as an initial target, ahead of a crewed mission to the Red Planet itself. Utilizing several Space Launch Systems (SLS) – mainly to loft the large segments of a Mars Transport Vehicle (MTV) into Low Earth Orbit (LEO) for assembly – a crew would be expected to undertake a mission of up to 650 days. “A human Mars Orbit/Phobos Mission represents an intermediate step between human exploration missions in near-Earth space and human missions to explore the surface of Mars,” opened the expansive section on the manned missions to Mars/Phobos. 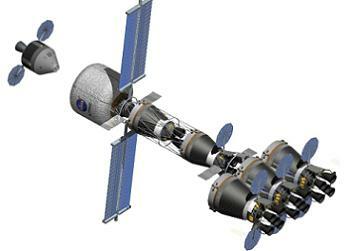 Such “short-stay” missions range from 550-650 days, with 30 to 40 days in the vicinity of Mars. Over 95 percent of the total mission time is spent in the deep-space interplanetary environment with the balance spent in the vicinity of Mars. 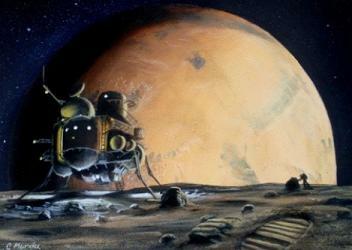 The reason Phobos is the likely first target of a Mars mission relates to the additional challenges of entering Mars’ atmosphere, but also includes relevance to the science collection efforts being simulated by the missions taking place this year on Earth, such as the international Pavilion Lake Research Project (PLRP). 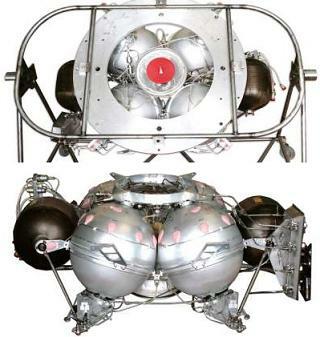 The science-rich moon was also a key part of the presentation, which in turn shows why the Russians had put so much effort into Fobos-Grunt – not least because of the sample-return nature of the mission. Such crewed mission for NASA is unlikely until the 2030s, meaning robotic missions – such as Fobos-Grunt if returned to health, and NASA’s upcoming Mars Science Laboratory (MSL) launch – will continue to be the mainstay of mankind’s knowledge base on the Red Planet, whilst providing precursor missions for what will be biggest exploration challenge for the human race.